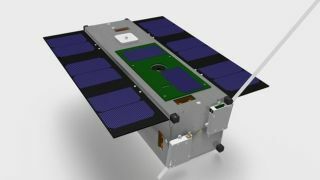 The unique and innovative satellite, called STRaND-1, is a 30cm CubeSat weighing 4.3kg. The United Kingdom Space Agency's miniature STRaND-1 satellite launched into space on Monday (Feb. 25) is one of seven spacecraft riding into orbit aboard an Indian rocket. It will test several new space technologies, including its WARP DRiVE — a novel space propulsion technology that will test a water-alcohol based thruster system. Follow TechNewsDaily on Twitter @TechNewsDaily, or on Facebook.You can follow SPACE.com Managing Editor Tariq Malik on Twitter @tariqjmalik.